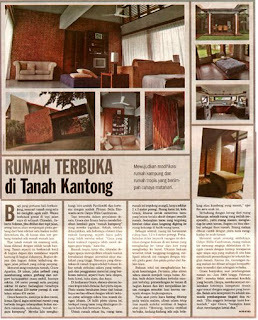 Here's another review on Irman's House by Koran Tempo. The issue was to create an open contemporary house on a secluded site. The house actually can be reached through a 40 m entrance corridor, which creates a surprising sequence from tight entry to a spacious and sheltered reception. A series of openings after blocking walls was the concept in order to get the feeling of the 'openness'. This was the main idea of what the ground floor should look and relate to other rooms. bapak2, bila tak menyusahkan bisa dipindai artikelnya secara penuh dalam ukuran yang cukup untuk dibaca secara online? atau ulasan lengkapnya disalin secara utuh?